Whoever came up with the phrase “I slept like a baby” must not have been a parent, because every new parent quickly realizes that babies don’t always sleep very well (or at least mine haven’t)! Sleep deprivation is one of the hardest parts of being a new parent. You desperately need sleep to recover from giving birth, but that can be hard to come by with a new baby in the house. I clearly remember the first time I really got what being a parent was all about. We had just had our first child at home, and Sean and I had crashed in bed with our little son tucked in beside me after the birth to get some sleep. About an hour later he woke up and started crying and I had to get up and go sit in the rocking chair in our little nursery and tend to him. I remember sitting in that rocker feeling so dazed and tired, and the realization that this was my new life. I was happy, but oh-so tired at that moment. Seven children later and the need for sleep is still there, though I’ve learned a few things along the way. Sleep when baby sleeps – this is a common phrase you hear given to new mothers, and in a way it’s totally true. When the baby is little and you are still trying to recover, it’s an excellent way to be able to catch some sleep. I struggled quite a bit to sleep the first week that Emily was born, as she was gagging and choking and I just couldn’t relax to fall asleep. That finally went away and the first time I was able to take a good nap with her was a blissful moment! At some point though moms start using the time that baby sleeps to get some things done, especially if there are older children in the house! Don’t feel guilty over making sleep a priority. This time around I decided that getting some sleep at night needed to be something I prioritized. With six other children in the house I knew that I would be a much better mother if I got a halfway good night’s sleep. I know that a parent has little control over how a new baby sleeps, but I was going to try and do my best to help my baby sleep. I also do on-demand breastfeeding, so if my baby wakes up 5 different times at night, that means I’ll be nursing that many times. I know this can be a controversial topic, but we have always co-slept with our babies. There are things I absolutely love about co-sleeping, and there are a few things that I’m not crazy about. I quickly realized that if I was going to get any sleep as a breastfeeding mother at night, I needed to learn how to safely co-sleep. There are guidelines and suggestions available everywhere online of how to safely do that. This time around I wanted to try something a little different though. I wanted baby in bed with us, but I didn’t want to be confined to one spot the whole night, or feel totally stiff when I woke up in the morning. I did some research and decided I wanted to try an actual co-sleeper that we could put in our bed with us. After looking around at what other moms suggested, the DockATot seemed to be the most popular one. The company was kind enough to send me one to try with Emily. It feels strange to be doing something different this time around, but I can honestly say it’s been the best decision. 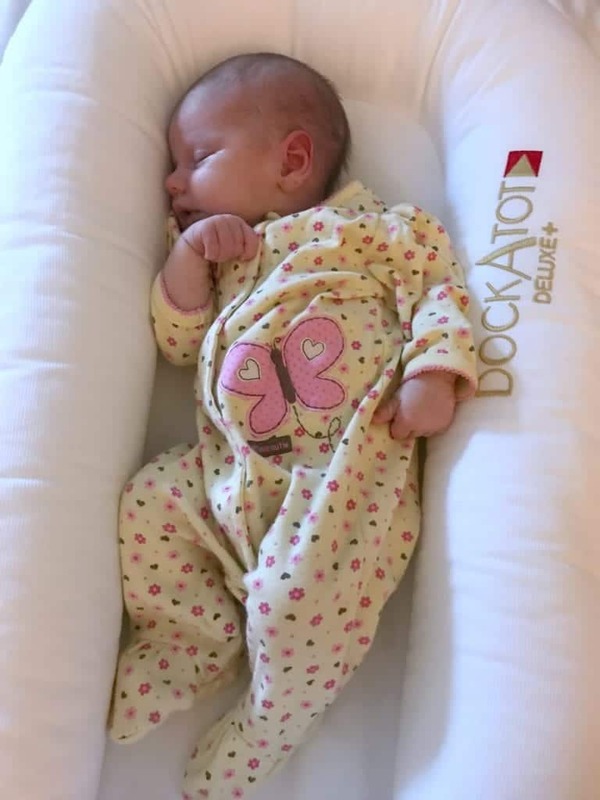 The DockATot is basically a portable little bed for the baby that can go in your bed, and you can bring it with you on trips, or let them sleep somewhere else in the house (like on the living room floor while you are reading a book to your older child on the couch!). 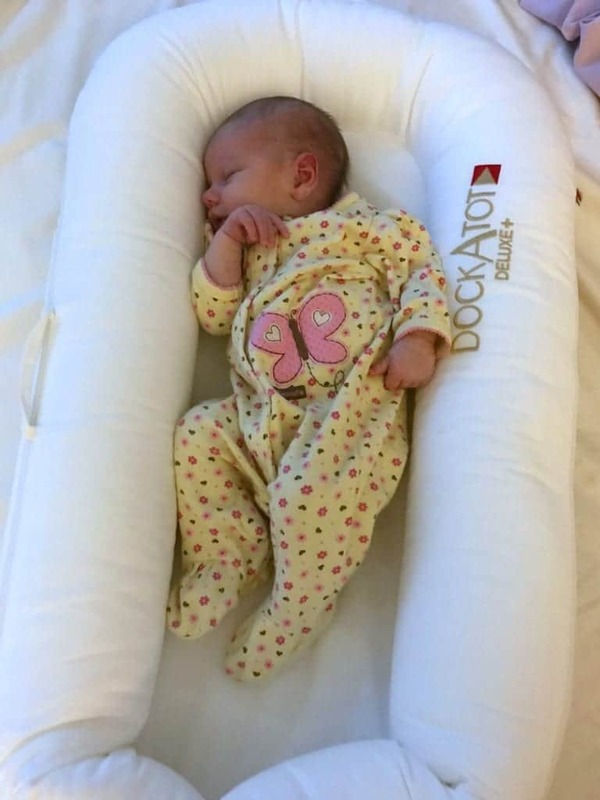 The DockATot Deluxe is supposed to work with babies up to 8 months, and then they have a larger one for older babies. It fits just fine in the middle of our bed, but we have a King size bed. I think it would be a tight fit in a bed smaller than a King size. We didn’t try using it for the first few days, but then I was so tired we got it out of the package and put in our bed to use. The first night that Emily slept 4 hours straight in the DockATot felt amazing! I was able to receive 4 hours of deep, uninterrupted sleep. Hallelujah! Emily is 4 weeks old right now, so it’s not a for sure thing that she will sleep in it every night. For her, what I’ve found is that I need to nurse her to sleep on the couch and then sit and hold her about 30 minutes to get her in a deep sleep. I carefully walk back to my bedroom, and put her down in the DockATot to sleep. It’s not the cheapest baby item (it starts at $175.00). The cost initially surprised me and I think it could stop people from considering it. But you have to think about what a priority your sleep is, and then reconsider if it could be worth it. I’ll leave you with this final verdict. Last night Emily slept from 11:00 until 5:00 in the morning in the DockATot. Wahoo! I woke up feeling better than I’ve felt in a long time, and I was finally able to get this blog post finished because I actually received enough sleep! *I received this product compliments of DockATot to try. I have a ten month old and we also used something like a dock a tot. It’s a LAPPI BABY sleeper (found on Amazon, half the price of Dock a Tot). He slept in that in the middle of our bed, then we moved his LAPPI Baby into his crib. Just stopped using it as he got too big. I always find the phrase “slept like a baby”, funny. A baby wakes often, so it doesn’t make sense to me. I do know a lot if mothers who have newborns (and are breastfed), whsle sleep all night. I like this idea. We are expecting #4 and I have coslept with all of them until they night wean. I too have experienced the stiffness of odd sleeping positions during cosleeping. I agree with the first comment. Ina May Gaskin herself points out that feminists who aschew motherhood are giving up so much of their feminine power. The hand that rocks the cradle rules the world.